Ready or not, it’s time to say goodbye to Rick Grimes, the leader of the ragtag group of zombie apocalypse survivors played for nine seasons by Andrew Lincoln. Season nine episode five is titled “What Comes After” and marks the end of the road on AMC’s The Walking Dead for Rick and Andrew. Rick’s farewell episode found him taking a stroll down memory lane, reuniting with characters who’ve exited the series in previous seasons. The very emotional season nine episode five opens with injured Rick telling an unconscious Rick in a hospital bed to wake up. He finally takes his own advice and wakes up, still pierced by rebar with blood pouring from his wound. The slowest bunch of walkers ever appearing in The Walking Dead can’t close the 20’ gap before Rick can muster the strength to remove the rebar. Stumbling away, he makes it to his very patient horse, climbs in the saddle, and sets off on a slow pace just ahead of the merging hordes. Elsewhere, Jadis (Pollyanna McIntosh) attempts to start a car as the voice on the walkie talkie asks for her location and if she has the “A.” She gives her location and says she has the “A” and is ready for transport. He warns her if it’s a trick, there will be consequences. Back with Rick, his white horse has turned a disturbing shade of pink from the blood. He tries to talk himself into staying awake but he’s having a rough time of it. The walkers nearly reach him as he briefly passes out while scenes from his past flash through his head. Meanwhile, Maggie (Lauren Cohan) and Dianne (Kerry Cahill) continue their ride to Alexandria, taking out walkers as they come upon them. Maggie’s current weapon of choice is the crowbar and she’s brutal wielding it. Rick notices a mailbox up ahead and has a renewed burst of energy. He and the horse pick up the pace and disappear from sight of the horde. He stumbles into a cabin and rips apart sheets to try and stop the bleeding. The cabin was the scene of a shootout and the walls are dotted with bullet holes. He passes out again and has a dream in which he’s talking to Shane Walsh! (Welcome back Jon Bernthal, however temporarily!) They talk and Rick says he’s looking for his family. Shane asks after his baby girl, and they joke about whether Judith has Shane’s eyes or nose. “Good thing she ain’t got my ears, man,” laughs Shane. It’s a good-natured reunion in which they call each other assholes, but out of love. The talk does turn serious when they discuss Shane’s final days. Shane warns Rick he has to remember when he was mean and dirty and return that way to finish this job now. He has to dig down deep to get this done. “You can do it, brother,” says Shane. Rick apologizes to Shane and then Shane screams, “Wake up!” in his face in the dream, just as a walker’s about to make a meal out of the slumbering, wounded Rick. Rick jolts awake in time to avoid the bite. He breaks through a wall and barely escapes ahead of the front of the horde. 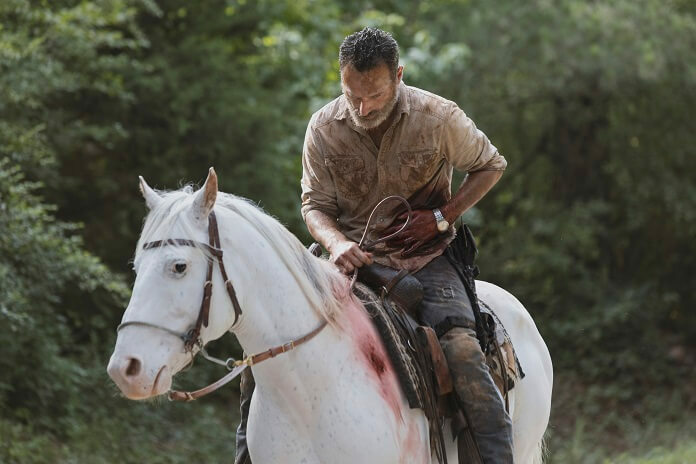 Rick manages to get back on his horse who has, once again, remained bizarrely calm with all the walkers nearby. Over at Alexandria, Judith and Michonne (Danai Gurira) are going about their day like normal. The calm is shattered by the surprise arrival of Maggie. Maggie carries the crowbar as a weapon and demands Michonne get out of her way when she heads over to kill Negan. Michonne refuses to budge even though Maggie reminds her what Negan did. She admits she’s not sure what Glenn would have wanted, but she never got to say goodbye. She’s furious Michonne and Rick took away the only thing she wanted – getting to see Glenn’s murderer die. Maggie insists killing Negan would help start things over. She tries to get Michonne to admit that if Negan butchered Rick in front of her and left her with a baby to raise alone she’d do the same thing. Maggie has suffered a year and a half and refuses to suffer any longer. Maggie gets emotional as she says she can’t keep living like this, and Michonne even tears up. Michonne hands over the keys after a final warning that Maggie might not be able to live with herself after she kills Negan. The moment’s come and Maggie is face-to-face with Negan (Jeffrey Dean Morgan). Negan looks at Maggie and says, “I remember you screaming in that clearing. I remember how much I broke you breaking open your husband’s head like I did,” taunts Negan. Maggie claims she’s there for justice, not revenge. She demands Negan get on his knees but instead Negan keeps describing what he did to Glenn in graphic detail. He even admits he enjoyed killing Glenn. Negan finally gets on his knees and Maggie’s about to open the cell, even as Negan continues to taunt her, but something makes Maggie think twice about her actions. Instead of unlocking the cell, she instructs Negan to come into the light. He doesn’t, continuing to verbally abuse her. When she won’t open the door, Negan begins crying and begging her to kill him. He continues to beg her to not make him stay like this. He wants Maggie to settle it and put him out of his misery. When she tells him to get back in his cell, he begs her to finish him. She won’t kill him because he’s already worse than dead. Negan continues to cry as the cell door locks behind him. Maggie emerges from the jail and Michonne immediately notices her crowbar is clean. They look at each other, understanding what happened. Dianne interrupts and tells them something’s up at the camp. Rick’s back on the horse, barely conscious and continuing to have flashbacks. He sees Hershel (Scott Wilson, may he rest in peace) and together they look out over the farm. Rick praises the place, calling it beautiful, and then they hug. Rick says he’s sorry for what happened to him and for everything Maggie’s lost. “My girl, she’s strong. And my grandson, he’ll only make her stronger. You ain’t got to worry about her,” says Hershel. Rick says he needs to find his family because he must keep them together. Hershel tells him he doesn’t and that everyone will get to the place they need to be. Rick admits he’s tired and that maybe he can find his family here. Hershel responds, “No, Rick. You have to wake up,” and then nudges him back to consciousness. 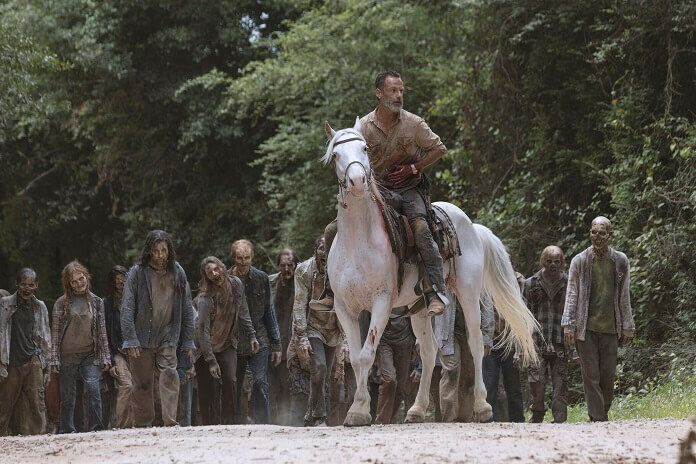 The horse is the only thing keeping Rick ahead of the walkers as Rick’s no longer strong enough to lead the way. “It’s never the end of everything because we don’t die. It’s not about you or me or any one of us. It’s about all of us. And I don’t think it just evens out. I think it always crosses over toward the good, toward the brave, toward love,” says Sasha. She tells an emotional Rick that his family isn’t lost and neither is he. She wakes him up as he falls from his horse. This time the ever-patient horse races off without him. Blood pours from his wounds as he makes it into the bridge camp. Saviors who’ve been turned into walkers wander toward him. Rick picks up his gun and begins taking them out. The gunshots attract more walkers who tear down the camp as they walk through it. Rick gets to his feet and walks at a pace barely above a walker’s back to the road. He glances over his shoulder as his pace slows down even further. Finally, he falls just feet from the bridge. With his vision blurring, he hears Daryl (Norman Reedus) call his name. He then sees his friends all running past him to take on the horde. Ezekiel, Maggie, and even Eugene have arrived to save the day. Michonne tells Rick it is real, gives him a kiss, and then says to wake up. Rick comes to once again, feet from the bridge. He manages to get back on his feet and walks across the bridge. He stumbles once on the other side but gets to his feet again. As the horde walks over the bridge, it holds together and Rick can’t believe the bridge didn’t fail. He’s no longer able to walk ahead of the walkers and as one approaches to take a bite, an arrow takes it out. Rick glances over and sees Daryl and his friends, but of course he doesn’t believe they’re real. Another walker gets within biting distance, and another arrow from Daryl fells it. Carol (Melissa McBride), Eugene (Josh McDermitt), Maggie, Jesus (Tom Payne), Michonne, and more have actually arrived and they realize Rick’s hurt and that he’s trying to bring down the bridge. Maggie wants the horde to turn around and tells the gang to fire their guns to divert them. It doesn’t work. Rick tries to signal to his friends to go away because there are too many walkers. Daryl continues to pick off the walkers who get close to Rick. As the walkers head toward him, Rick notices they’ve knocked over a box of dynamite. Maggie and the crew race along the road toward the bridge as the walkers continue to march forward. Daryl runs out of arrows. The bridge goes up in a massive ball of flames. Daryl sobs as he looks toward the last place he saw his friend. Walkers on fire plunge to their final deaths off the destroyed bridge. Nearby, Michonne is overcome with grief and Maggie and Carol try their best to comfort her. Daryl, alone, walks slowly into the woods. Jadis sees the smoke as a helicopter arrives. She then watches as body parts float by in the river. However, that’s not all she sees. Rick, barely alive, is near the river. She calls to the chopper and says she never had an A but she has a B who’s badly hurt. She asks if they can help. She assures them it’s not a trick and that she’s just trying to save a friend who saved her. She demands to know if they have a deal. In response, the chopper lands. Rick’s loaded in the helicopter with Jadis, and she assures him she’s going to save him. They fly away with Rick being tended to. The episode ends with a group of people attempting to hold off attacking walkers. Shots are fired and a path is opened up for them to escape into the woods. There, they encounter a young girl who asks their names. The young girl bends to pick up a familiar hat, places it on her head, and introduces herself as Judith Grimes. We’re apparently leaping forward in time once again. The previews for the next three episodes show Carol with longer hair, Michonne with a different style, Eugene sporting a new haircut, and a still alive Negan. Thank you Andrew Lincoln for nine seasons of playing a character we loved, sometimes hated, occasionally got frustrated by, but ultimately had come to really feel like we knew. Season nine episode five ended with a plot twist that left open the possibility Rick Grimes/Andrew Lincoln could eventually return. That Rick’s exit would come as part of the Jadis/helicopter storyline was unexpected but actually a pretty interesting way to end his The Walking Dead storyline. During Talking Dead, Scott Gimple cleared up what the episode’s ending means. Gimple explained this would be the end of Rick Grime’s story on The Walking Dead but not the end of Rick Grime’s story. Rick’s story will be told in a series of original films on AMC. Gimple also said there’s a lot of story to tell and that the original films will expand The Walking Dead universe. The original films will screen on AMC, but they’ll have the scope of a feature film. “We’ll be seeing an epic story told over years,” said Gimple. There will also be much more to this expanded universe than just Rick Grime’s story. Next Article ‘The Walking Dead’ and Andrew Lincoln: What’s Next for Rick Grimes?